"I developed this simple site to acquaint others with my professional skills, experience, and qualifications." I developed my first computer program in March 1984, using the BASIC programming language. It was developed on an IBM PCjr that my grandfather purchased for my 14th birthday. It utilized two techniques that should be avoided in almost all software development: (1) a GOTO statement, and (2) an infinite loop. Nonetheless, it created a spiraling rainbow of text that showed off the entire spectrum of colors available to the IBM PCjr—all sixteen of them! I began developing software professionally in 1996. Throughout my career, I have mostly developed applications for the Internet. I have developed tax and accounting software, online banking applications, digital signage software, network monitoring systems, self-service benefits applications, mortgage and home affordability calculators, and even tools to plan air campaigns for the United States Armed Forces. I am a landscape architect. I earned my license to practice landscape architecture in the State of Georgia (License #LA001543) in 2008. My license is valid through 31 December 2016, and I intend to maintain it afterwards. To earn a license (in Georgia and elsewhere) you have to pass five core exams pertaining to: (A) Project and Construction Administration, (B) Inventory, Analysis, and Program Development, (C) Site Design, (D) Design and Construction Documentation, and (E) Grading, Drainage, and Stormwater Management. Georgia also requires you to pass an exam that tests you on native plants and the state's specific natural resources. The exams are difficult. The Section C and E exams are each five hours long, and you typically use all of the time alotted. It's not uncommon for more people to fail these two exams than to pass them, which is remarkable when you consider that most test-takers are not taking the exam for the first time. 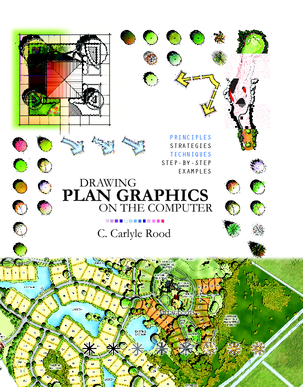 In 2010, I published Drawing Plan Graphics on the Computer as an instruction book for landscape architects to teach and demonstrate drawing principles, strategies, and techniques. The Georgia Chapter of the American Society of Landscape Architects has recognized it with their 2010 Award of Excellence. I used Adobe Photoshop to create hundreds of illustrations, and used Adobe InDesign to layout the manuscript for traditional book printing. I later adapted the PDF generated from InDesign and optimized all the images to produce a three-volume eBook in the ePub format (which is nothing more than a glorified HTML document that's been zipped up in a specific hierarchy of files and folders). I also developed a website to promote the book and share source files used within it: DrawingPlanGraphics.com. The logo was inspired by the tartan of clan Fraser of Lovat, a Scottish highland clan of which I am a descendent through my mother. Instead of merely interlocking green and blue bars, though, I altered the horizontal bars to mimic my first and last initials. I then amplified the intersecting white bars to create a cross, which is both emblematic of my last name (Rood, which is an Old English word meaning crucifix) and my Presbyterian Christian faith.